What is the smallest number of $45^\circ-60^\circ-75^\circ$ triangles that a square can be divided into? I've offered a prize for this problem: In US dollars, (\$200-number of triangles). 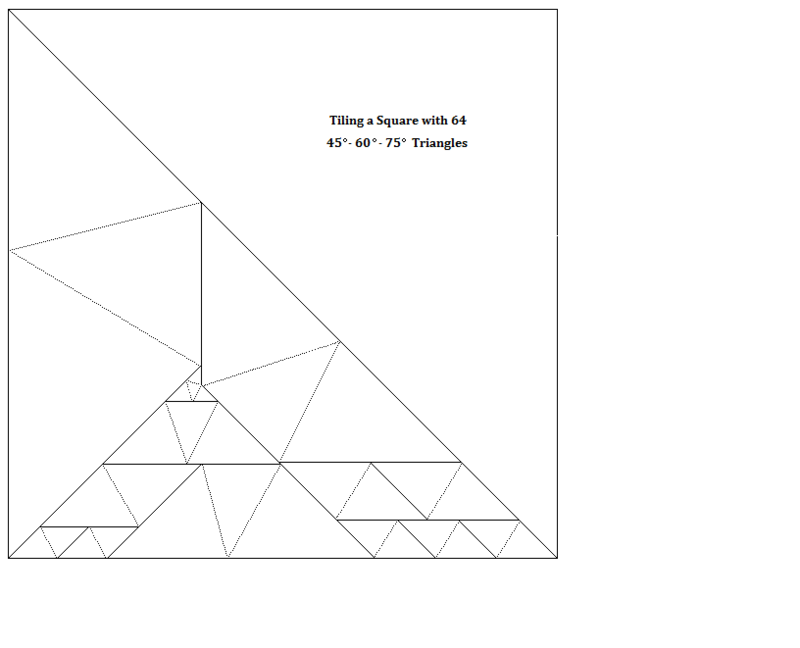 NEW: The prize is won, with a 50 triangle solution by Lew Baxter. Actually i tried to find an optimal solution with a minimum number of tiles by creating a database with about 26.000 unique rhomboids & trapezoids consisting of 2-15 triangles. I searched trough various promising setups (where the variable width/height-ratio of one element defines a second and you just have to look, if it's in the database,too) but nothing showed up. So this 46-tiles solution was in some sense just a by-product. As there probably exist some more complex combinations of triangles which i was not able to include, an even smaller solution could be possible. I improved on Laczkovich's solution by using a different orientation of the 4 small central triangles, by choosing better parameters (x, y) and using fewer triangles for a total of 64 triangles. The original Laczkovich solution uses about 7 trillion triangles. The following was posted by Ed Pegg as a suggested edit to Lew Baxter's answer, but was rejected for being too substantial a change. I thought it was useful information, so I reproduce it below. If you no longer want it to be posted here, Ed, leave a comment and I'll delete it. I have no answer to the question, but here's a picture resulting from some initial attempts to understand the constraints that exist on any solution. This image was generated by considering what seemed to be the simplest possible configuration that might produce a tiling of a rectangle. Starting with the two “split pentagons” in the centre, the rest of the configuration is produced by triangulation. 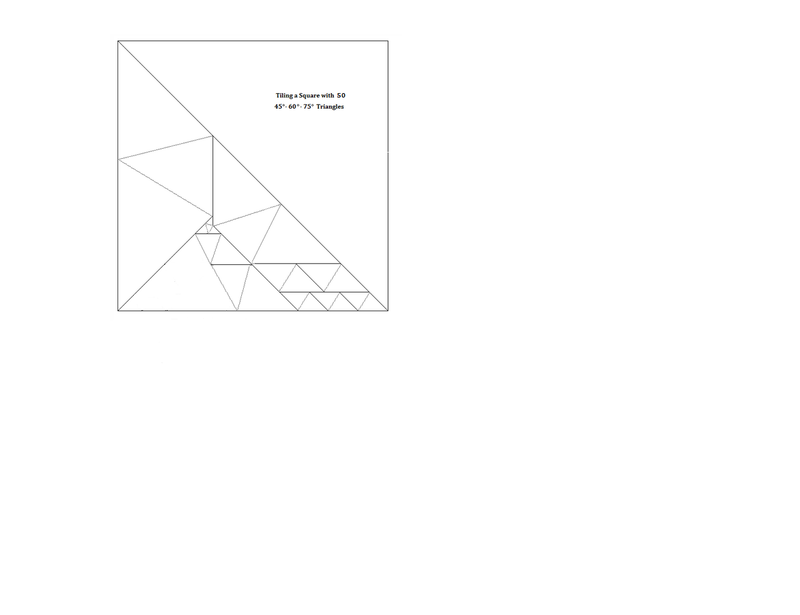 In this image, all the additional triangles are “forced”, and the configuration can be extended no further without violating the contraints of triangulation. If I had time, I'd move on to investigating the use of “split hexagons”. The forcing criterion is that triangulation requires every vertex to be surrounded either (a) by six $60^\circ$ angles, three triangles being oriented one way and three the other, or else (b) by two $45^\circ$ angles, two $60^\circ$ angles and two $75^\circ$ angles, the triangles in each pair being of opposite orientations. Not the answer you're looking for? Browse other questions tagged geometry puzzle recreational-mathematics open-problem tiling or ask your own question. What is the smallest unknown natural number? What is the smallest number of $45^\circ$–$60^\circ$–$75^\circ$ triangles in non-trivial substitution tiling? Is there a way to divide an integer-sided square into integer-sided non-right triangles? What is the smallest square into which one can pack a trisected disc?